Potty training is hard when you’re trying to train your kid. It’s especially hard if you’re trying to train the boys in your life to put the seat down. Please Put me Down has come up with a solution to one of the problems women face in their own homes. Mike Mercer is the founder of Please Put Me Down.com. Having grown up in a home with two girls and three boys he remembers the common event of a BIG SPLASH followed by a yell, “Please Put That Seat Down!” Many women across the country share this sentiment and often try to instill the habit of putting the seat down during potty training! 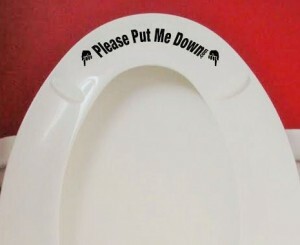 Please Put Me Down has a cute solution for this problem by creating a helpful reminder sticker that sticks on the bottom of any toilet seat. “Please Put Me Down” stickers are great for homes with younger (and older) boys learning (or still learning) the ropes of toilet-seat etiquette. The transparent sticker has super reinforced ink is simply applied to the underside of the toilet seat where it fits perfectly. It acts as a constant reminder to the men in the home, as they’re finished at the toilet, to always glance one last time at the seat and… Please Put It Down!